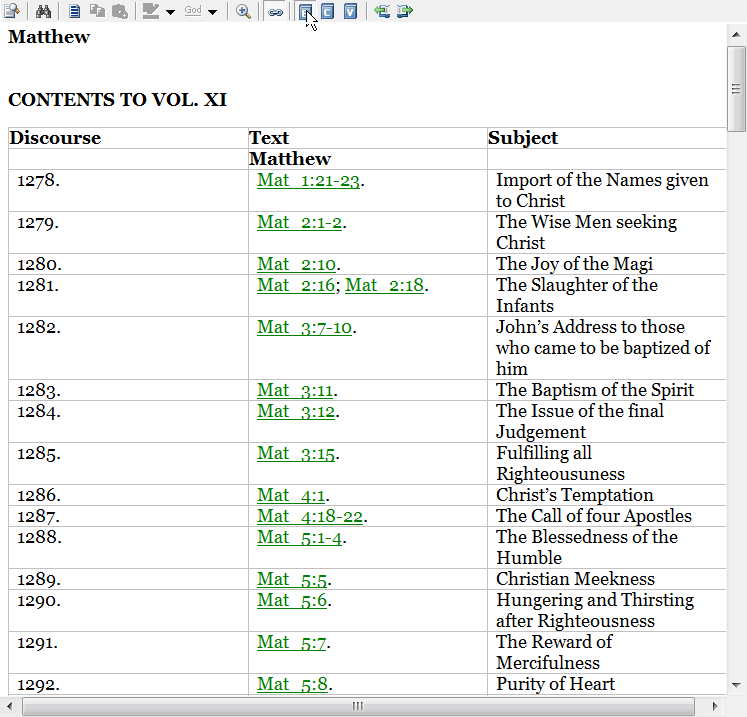 This isn’t just an expositional commentary, it’s a teaching tool with 21 volumes and 40 megabytes of text. It’s a goldmine for experienced preachers, but it’s also an excellent aid for inexperienced preachers who might still need someone to walk them through a biblical text and help them expound upon it. Charles Simeon was one of the most prominent evangelical clergymen in the Church of England in the late 18th and early 19th Centuries. He was known both for his passion for mission and his extraordinary biblical preaching. But when Simeon looked at the clergy around him he saw men who were often unable to preach well. They either preached poor sermons or they parroted the sermons published by others. Simeon’s passion for preaching drove him to collect and publish his own sermons, preached from Genesis to Revelation and spanning fifty-four years of ministry. The e-Sword edition includes the primary commentary file and 2 supporting Reference Library files (Subject and Lectionary Index and John Claude's revised essay on sermon composition). Volumes I and XXI of the printed edition are of special note. The first volume contains Simeon’s introductory essay, which is often quoted and referred to in other books on preaching. In e-Sword, select this commentary and click Commentary > Information to view the introductory essay. While it’s short, it’s also inspiring, explains Simeon’s homiletic rationale, and serves as a sort of “user’s guide” to the whole series. The final volume includes copious indexes, including Subject and Liturgical/Lectionary indexes, as well as Simeon’s “improved” version of Jean Claude’s excellent essay on sermon composition. Simeon even includes several of his own skeletons to illustrate Claude’s instructions. See the files: Simeon, Charles - Subject, Liturgical, Lectionary Indexes.topx and Simeon, Charles and Claude, John - Claude's Essay on the Composition of a Sermon.topx. These expository outlines (or 'skeletons') are not a verse-by-verse explanation of the English Bible. Rather, they are a chapter-by-chapter study with explanations of the most important and instructive verses in each chapter. Simeon's aim with this commentary is 'Instruction relative to the Composition of Sermons.' To this end, his exposition of the Scriptures is designed to maintain a focus on the more general aspects of a passage over and above possible treatments of particulars. His test for a sermon, as he teaches in Horae Homileticae, is threefold: does it humble the sinner, exalt the Saviour and promote holiness? Corrected Genesis and Exodus discourse references. This set is one of the most helpful for the study of the Word of God. It is unhampered by the vain philosophies of today and is unique inits presentation of the truth. How wonderful that we have access to a most extraordinary set of commentaries as those of Simeon! May God bless those who have made this format available to us old "retired" preachers. I could not have said it better than Pastor Gary.. There always seems to be so much more value in the older works. It is like fine wine. So much better with age. Not hindered by its age, it is preserved as a jewel that stands out among a multitude of lumps of coal. Thank you so much for making available this wonderful tool! Can you please have a look at Discourses 18-20 in Genesis. They don't show up for me. Thanks, corrected Genesis and Exodus discourse references. I deleted my original download of the Commentary...Subject Lectionary Index...John Claude Essay Sermon Comp. When I downloaded it anew only the Commentary came thru on Exec....repeated this on zip and got the same thing.It may be something I'm doing....may not be. Give it a check just in case. Whenever I tried to unzip the .zip file, both Peazip and 7Zip say the archived files (the cmtx and 2 topx) are unsupported However, I was able to get the .exe to work. It's just that I prefer .zip because I have my anti-virus set to confirm permission every time I run a new .exe.